I prayed that I had not understood. “Did they burn his house, or his body?” Please God let it be just his house. 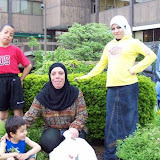 The “us” to whom Thaer refers are Palestinian refugees. Numbering about 34,000, most of them were born in Iraq. But Iraq does not grant them citizenship. They cannot vote, hold office, own firearms, or buy a house or property. They must apply to renew their residency in Iraq every two months. The countries that border Iraq do not accept their travel documents, and so Palestinians are stuck in Iraq. Such circumstances are difficult. But in recent months, life for Palestinians in Iraq has descended into the realm of nightmare. The new Iraqi security forces, supposedly the salvation of the country, have a dark side: numerous commando groups, some government-sanctioned, others shadowy and independent. They come to Palestinian neighborhoods in the dead of night, raid homes, terrorize women and children, and sometimes imprison and torture the men. 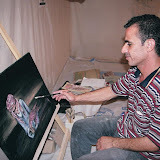 Last summer, Thaer’s best friend was detained by Iraqi forces. The friend’s dead body turned up later, marked by burns, drill holes, and evidence of electrical torture. Last spring, after a bombing in Baghdad Jadeeda, Iraqi forces raided the Baladiyaat neighborhood of Baghdad and detained three Palestinian brothers and their neighbor. The four young men then appeared, with bruised faces, on a popular Iraqi TV show called “Terrorism in the Grip of Justice.” They later told their lawyer that they were innocent and had confessed to the crime because of torture. Why is this happening? Because Saddam Hussein made a public show of supporting Palestinians in Iraq, claiming on TV that he gave Palestinians free cars and apartments. Even though Palestinians in Iraq insist that most of this was propaganda, Iraqi public opinion turned against them. More than sixty Palestinians have been killed and thousands displaced since the fall of the regime. 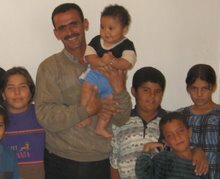 In October 2005, a group of courageous Palestinian families – seven children, five women and seven men -- decided to take the huge risk to leave everything behind and flee to Syria. 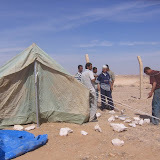 They asked members of Christian Peacemaker Teams (CPT) and Iraqi Muslim Peacemaker Teams (MPT) to help them through the Iraqi military and police checkpoints. Tom Fox, Beth Pyles, I, and our MPT colleague Sami accompanied them on the journey. Along the risky road between Baghdad and Syria, and in tents for weeks in no man’s land, we became one family. There was Idrees and Bushra* and their four children, ages 1, 8, 12, and 13. “We’ve been harassed in Iraq,” Bushra told me. 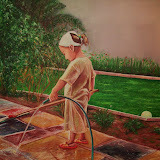 “One morning at 3am, Iraqi soldiers barged into the house. They dragged my husband half-dressed into the street. They pointed a gun at my daughter’s head. This has happened more than three or four times.” Their littlest child, one-year-old Emir, was sick during the trip. I watched as his father mixed together hydration medicine and spooned it gently into the baby’s mouth. “I have to renew my residency every two months. It takes all day, and the office is in a dangerous place. If we do not get into Syria, I will stay in no man’s land and never go back,” he said. Oct 4: After the first night under the stars, the hard reality of life on the sidewalk of a border crossing hits us. Desert in all directions, by 8:15am we are beginning to bake in the sun. A truck driver notices the women and children, and moves his lorry so that it casts a swath of shade over the sidewalk. The babies gurgle. Trucks roar past, shrieking brakes and horns. The smell of tar and gasoline hangs in the air. Beth and I interviewed more of our fellow travelers. Abdullah, 44, with prematurely white hair and calm eyes, carried himself like a dignified general despite slight paralysis from an old injury. He had spent the entire past year in fear within the Palestinian compound in Baghdad. “I have seen the raids, the torture, and the detentions,” he said. “I saw one Palestinian man who has psychological problems walking in the compound one day. The Iraqi Army put a bag over his head and beat him for fifteen minutes with their fists, boots, and rifle butts. The people did nothing, because the soldiers have guns and we don’t. Thank God, the Syrian officials do not deport us back to the Iraqi border. Instead they move us into a small stone hut at the border’s gate. Its window looks out onto the raw desert. Oct 5: A representative from UN High Commission for Human Rights (UNHCR) arrives and is aghast. “This is unbearable,” she says. “We will try to find a solution. But it may take a long time.” She will bring tents, and arranges for two meals per day at the border’s cafeteria. Musa tells her about the torture, the killings. She interviews the women, and they ask for diapers and diarrhea medicine for the babies. 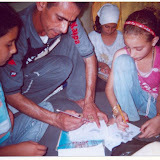 Oct 12: Our translator and I start a “tent school” for the five older children. I fumble through English lessons, he teaches art. Little Emir is sick again. Most of the adults are also coughing. It’s so cold at night, but at least 95 degrees during the day. The meals the cafeteria serves are not balanced – all rice and vegetables, no fruit and not enough protein. Omar, who is a barber, cuts the men’s hair and gives Tom a shave, the desert sun beating down. Later he gives free haircuts to all the cafeteria workers. Oct 15: I am sick now, too. Influenza. The days blend together. When will it change? When will we get the glorious news that some country in the world will welcome these people? Oct 17: Tom and I have to return to our team in Baghdad. The community expresses fear about what might happen to them. 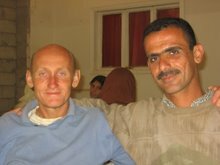 Thaer reassures them and us, “We will rely on ourselves now.” Tom and I promise to do all we can to prevent violence against their Palestinian communities in Baghdad, and to pressure the Iraqi and American governments to change. I’ve never felt more deeply that I was leaving my own family behind. 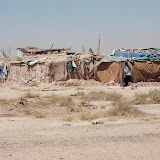 In late November 2005, the Palestinians were allowed to go to a refugee camp in northern Syria. However, they are confined to the camp and cannot travel or work. They live in clay houses without running water and without adequate heat. UNHCR provides them with subsistence rations (rice, beans, bread, oil, tea, and a few vegetables) but if they want a balanced diet they have to buy more food themselves. All are poor, and the largest family is destitute. They are still hoping to find refuge in a foreign country, and need all the help they can get in terms of advocacy, material aid, and funding. It will be along road. What do you do if the security forces that are supposed to protect people are attacking you? What do you do when the Ministry of Human Rights says that you are no different from Iraqis who suffer insecurity? What do you do when the death threat arrives on your door? Our Palestinian families in Iraq need our voices and actions, before it is too late. 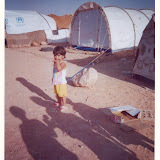 Syria eventually allowed about 300 more Palestinians into the UNHCR camp. However, the border is now closed. Syria will not allow any more refugees in, and Jordan, Iran, Turkey, and Kuwait will not allow any Palestinian refugees from Iraq to cross their borders. At this time, about 300 additional Palestinian refugees from Iraq are stuck in no-man’s land between Iraq and Syria. Comprising a majority of children and women, they have been there for more than six months and face a harsh winter living in tents in a scorpion-infested desert. The thousands of Palestinians still in Iraq, most of whom live in housing projects in Baghdad, live in constant fear.